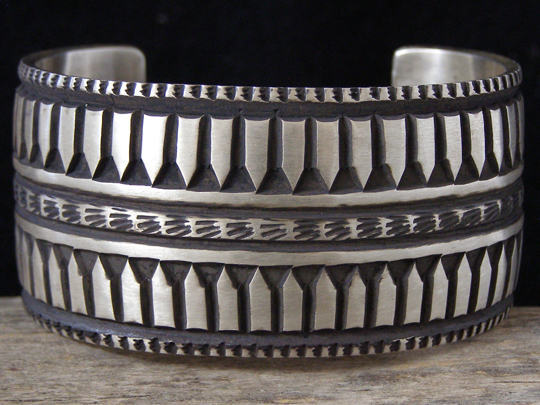 Elvira Bill Deep-Stamped Sterling Bracelet size 7 3/8"
Elvira Bill is the daughter of Emerson Bill and Nora Tahe Bill. She is also the sister of Jerald Tahe. Like Jerald, she learned to smith silver from her parents and makes bracelets in the same style as her parents. Some of her bracelets are made from a single thickness of sheet silver and stamped very deeply, while others are made from two layers of sheet silver and the design is cut out of the overlayer which is soldered to the foundational layer of silver. This wide bracelet is made from 12 gauge Sterling sheet silver and is characterized by deep, biting stampwork with the stamped portion heavily oxidized, while the unstamped portion is brushed to give it a matte finish. This cuff was shaped to soft convexity. Rustic, heavy, absolutely indestructible! Hallmarked Elvira Bill and stamped STERLING inside. Total inside circumference (including gap): 7 3/8"